Western has been on rocky financial footing since the two year state budget impasse. A third round of layoff notices was sent out on March 1, affecting another 132 employees, which is about 8% of the university's total workforce. The local chapter of the University Professionals of Illinois, which represents faculty and staff on campus, responded by circulating the Buy Into Western Illinois University petition. More than 6,000 people signed on. The petition asks for emergency funding for the school to stop the announced layoffs and the possible elimination of academic programs. It also asks Governor J.B. Pritzker to fill the current vacancies on the Board of Trustees. In addition to delivering the petition, more than 30 WIU faculty, staff, and students spent their time in Springfield meeting with state lawmakers including Rep. Norine Hammond (R-Macomb), Rep. Mike Halpin (D-Rock Island), Rep. Neil Anderson (R-Andalusia), Rep. Carol Ammons (D-Urbana), Rep. Nick Smith (D-Chicago), and Rep. Laura Fine (D-Glenview). A few from the group also sat down with Deputy Governor Jesse Ruiz. Bryan Nicholson with the Illinois Federation of Teachers said it was a very productive day thanks to so many state lawmakers being able to sit down to meet with the group. "We briefed them on what was happening at Western and a lot of what the [Western] administration has been up to, the legislators were not up to date on," Nicholson said. Another person on the trip told Tri States Public Radio that the lawmakers they spoke with listened, were receptive, and seemed genuinely concerned. Governor Pritzker was not in Springfield to receive the petition on Thursday. Instead, he was touring the Illinois Veterans Home in Quincy. 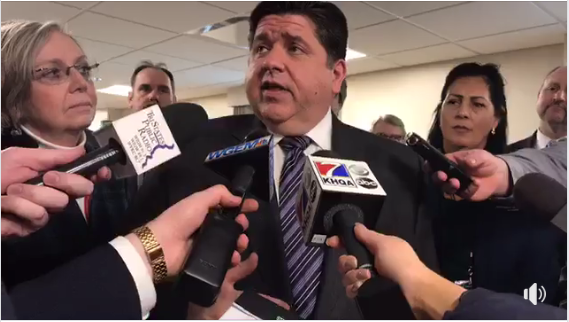 During a Q&A session with local journalists, Tri States Public Radio asked Pritzker about the Buy Into Western Illinois University petition and its request for emergency funding. “I want to make sure Western Illinois University is strong and that we do everything we can to not just lift up the university as it is today but to bring most students to Western Illinois,” Pritzker said. Pritzker said that his budget proposal includes more money for student scholarships and a 5% increase in state funding for higher education. “It wasn’t as much as I would like to increase funding, frankly, because our universities have been decimated over the last number of years with no budget for the last couple of years and, I think, intentionally by the prior administration to defund universities and have them fend for themselves. We’ve gotta step up for those universities. As to Western and now, we need to look at the availability of funds,” Pritzker said. To pay for that additional spending on higher education and to help balance the overall budget, Pritzker wants to add a number of new taxes on different products and implement a graduated income tax structure. “I have been crusading in a way to bring the right amount of revenue to the state and that we are finding proper cuts so that we can meet our obligations. We now have a $3.2 billion budget deficit that we are facing for the coming year and I’m trying to not only get past that $3.2 billion but also get us on firm fiscal footing forever,” Pritzker said. As for the six open seats on Western’s Board of Trustees, Pritzker told Tri States Public Radio that his office is close to making appointments and stressed that there are a number of vacancies on boards across the state they’re working to get filled. Pritzker reminded reporters he’s been in office less than two months and said the appointments should be announced within the next couple of weeks. “I’m making sure they are dedicated to upholding all the best traditions of Western and we make sure this is a strong liberal arts institution for the future,” Pritzker said. Pritzker said Deputy Governor Jesse Ruiz is handling the interviews for potential BoT members, but Pritzker said he also plans to speak with each of the nominees. Tri States Public Radio also asked the Governor about Western’s Board of Trustees and top administrators violating the Illinois Open Meetings Act during closed sessions on June 1, 7, and 28 of last year. Those violations are not simply allegations. Last fall, the Illinois Attorney General ruled Western’s BoT violated the Open Meetings Act on June 28 and ordered the university to turn over the meeting minutes and audio recording. And early in March, following a request for review, Western’s legal counsel self-reported OMA violations by the BoT during the meetings on June 1 and June 7. Western Illinois University has two campuses: Macomb and the Quad Cities. But that is not readily apparent when looking at the school's overall budget because it does not include a breakdown of revenue and expenses by campus. A new report aims to examine those costs. The recording of a closed door meeting held by the Western Illinois University Board of Trustees reveals board members repeatedly violated the Illinois Open Meetings Act (OMA).